BoscoLighting is supporting designers at CM Plus Architecture, delivering 3 installations this year! 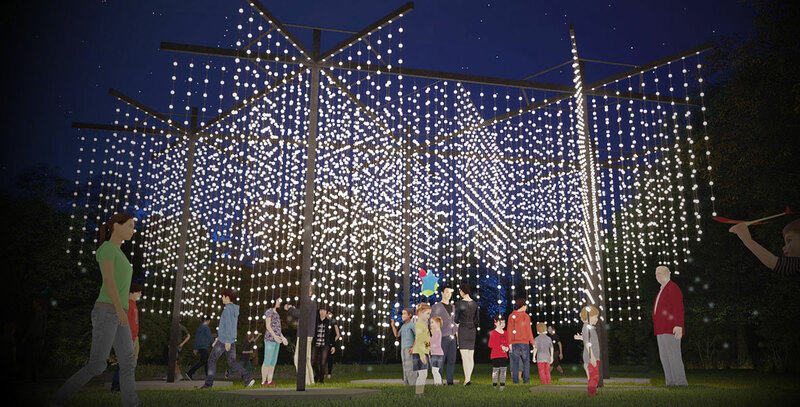 'Harmony', 'Nostalgia Above', 'Let it Snow' - These 3 interactive installations will be sure to capture the imagination of visitors young and old. All installations will be centrally located in the Sydney CBD. 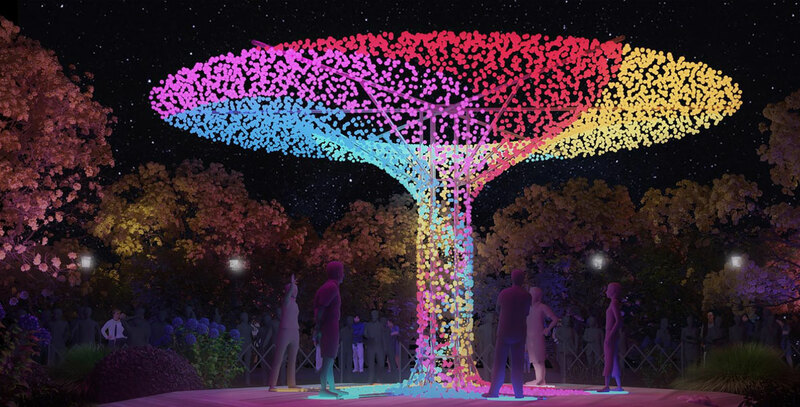 Mark your calendar now and visit the amazing light show this May. This page will be updated over the coming weeks leading up to VIVID, please bookmark this page for easy reference). Nostalgia Above brings the sky plane into a smaller context at Vivid 2019. 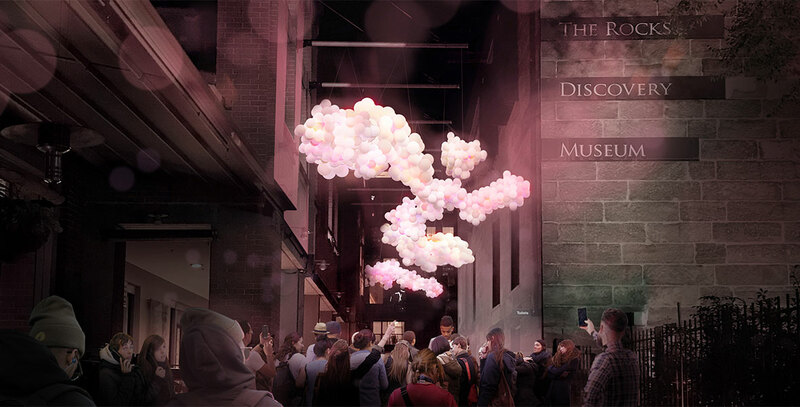 This beautiful installation utilises programmable LED bulbs, diffused through translucent polycarbonate spheres, to create an artistic geometric reinterpretation of the clouds we are all so familiar with. These clouds predict the weather of the summer 6 months ahead through sight and sound, reminding us that there is always a brighter, warmer day around the corner. This concept is articulated through the form of a tree, in which six elements of light and sound spiral from the root to the canopy. Through vibrant and distinctive colours, each segment represents a metaphor for different people, backgrounds and cultures. Together they become the swirling and spiralling embodiment of our interconnectedness and unison. The segments can be played like musical instruments. Visitors are encouraged to step on the illuminated pressure pads to trigger a unique animation of light and sound. Each element is one instrument in a symphony. When all six are triggered together, a memorising display is activated, celebrating our society’s unity. This synchronicity underscores the very essence of Harmony. Have you ever seen it snow in Sydney? This super-scale immersive and responsive installation makes it seems like giant snowflakes have landed at Hickson Road Reserve. This is an environment where virtual and physical worlds coincide. Walk between the crystalline structures for a sense of the way snow flurries. Illuminated by many thousands of LED bulbs, Let It Snow reacts to weather patterns and pedestrian motion. Light plays across the dendrites that give each snowflake its singular form. According to lead artist Jing Li, 'as you enter the piece, you are walking into a space occupied by real and virtual elements, and you can affect both. The space feels more turbulent and tempestuous when the wind is blowing and lots of people are playing, wandering and running around the flake shapes. On less busy evenings with little to no breeze, the spaces feels calm and gentle'. Whatever the level of activity, seating within the installation provides an opportunity to pause and marvel at this algorithmic snow show.